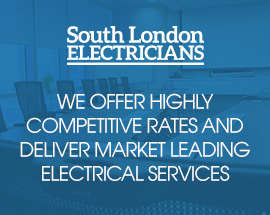 If you are looking for expert advice and professional service when it comes to electrical maintenance, repairs, replacements and installations, then look no further than South London Electricians. With over 20 years of experience delivering first class services to homes, businesses and large scale companies in London and the surrounding areas, Adrian and the team are a group of highly trained, professional electricians dedicated to ensuring complete customer satisfaction. Our incredible flexibility as a company is one of the many things that makes us stand out amongst other businesses. Whatever job or project you may need us for, we shall be equally happy to assist you, no matter how big or small. Since our establishment in the 1990’s, South London Electricians has performed maintenance and installation on over 3000 homes, and we have worked with several retail giants such as Sainsburys and All Saints over the years. We have also worked overseas for a number of international clients, both big and small and we are willing to go the extra mile to ensure customer satisfaction. Whatever your project is in Carshalton and the surrounding areas, we will work with you to make sure you are completely happy with our progress, every step of the way. Our business is registered with Checkatrade, TrustMark and the Competent Person Scheme, and we are also listed as NICEIC contractors, giving you added security in the confirmation that we are trusted and respected traders. Every single member of our team is highly qualified and has years of experience providing efficient electrical testing, maintenance and installation. If you have a query, by calling our number you can speak to one of our professional advisors who will at attempt to find a solution over the phone, or will arrange a convenient time for us to meet with you. We can provide a huge range of services, from fitting electric showers and LED light installations, to fuse board replacements, internet wiring, setting up home entertainment systems and fault repairs. If you are a landlord or a letting agent in Carshalton and would like an electrical inspection, or have maintenance that you know needs doing urgently, feel free to give contact us. Browse the links to your left for more information on the services that we offer, or alternatively you can get in contact with us with any queries or problems that you may need solving. Our telephone number is 07956 523316.